The gift of a calling is that it asks you to listen deeply to awakening, to face your inner critic with humble curiosity and to trust a process that will ultimately allow you and your community to grow in ways you had not imagined possible. Exquisite! Modern Day Mindfulness at Work was first offered as a pilot workshop, sponsored in part through a EAP Made grant. It took the form of intimate “virtual tele-class” professional/personal development sessions, workshop style, created and led by me, Kirthi Nath. 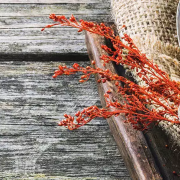 Modern Day Mindfulness at Work was created for heart-based movers and shakers interested in exploring spiritual mindfulness practices as a foundation for purpose-based livelihood and self-care. Core to the workshops were experiential meditation and creative presencing tools sourced from a variety of traditions — Buddhism, Tantra, Yoga. 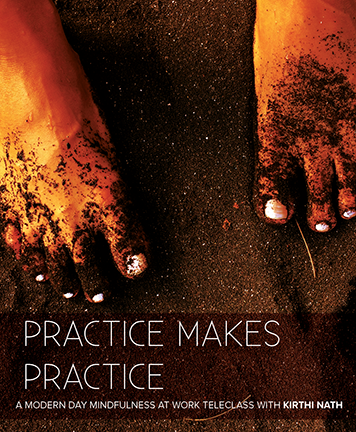 The workshops also included space for practice, reflection, and sharing. We met every Wednesday from 9-11 am via conference call for four weeks between January 14-February 4, 2015. Despite my experience as a teacher, vision for the workshop, and background with the topic, I had doubts. 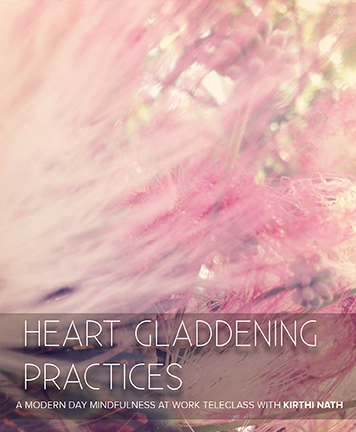 Are there other heart-based movers and shakers who are spiritual and curious how these practices can support them professionally and personally? Is it ok to say the word “spiritual”? 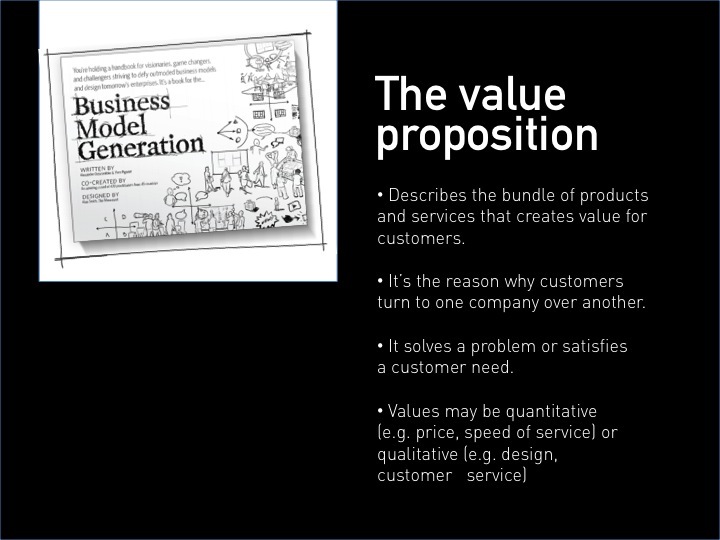 Would people have enough attention and bandwidth to be present for a workshop mid-week, first thing in the morning? Are the meditations I want to share too wild or too fill in the blank? Sometimes they can veer towards epic sensory spiritual adventures, other times they stay focused in breath, and I wondered how they would be received. Clearly, my inner critic had plenty to say. Instead of trying to push this away, I listened. My wiser self also had a vision — one that wanted to talk candidly about leading from love, intention and values, one that wanted to co-create opportunities to play and invite in magic, one that wanted to sign weekly emails with the salutation ‘love’. Instead of trying to push this away, I listened. To all voices. The dance with inner critic and wiser self: listening, letting go and letting be…LISTEN, LEAP, LOVE. Have you ever woken up and felt anxious? Do you check your gadget first thing? Have you noticed how even a simple email causes stress? If we take a breath, we can see and witness how the stress we feel is out of scale with reality. Yet we all feel the stress. I know I have. We live in a world of digital connectivity and addiction to stress. Yet, we want calm. We want creativity. We want to thrive. When I first proposed holding my workshop in the morning, I may have been shooting myself in the foot. So many of us wake up with these habits that stress us out. We feel we need to start working first thing. The truth about work is that we’re more productive when we are present. I recently co-produced a film interview with Annette Richardson, senior advisor at the United Nations for Partnerships. All day she interacts with hundreds of people and makes high-level, life changing decisions. When exploring success and self-care practices, she shared her key to “success”. She has a morning ritual to give herself time to wake up, free of stimulation from outside voices, emails and external distractions. In the morning she takes space for herself, to be quiet, so she can be present and available throughout the day to listen, interact and make decisions that come from a grounded place. It makes a huge difference to allow time for quiet in the morning, space for ourselves in the morning. For visionaries, this can be hard to do. It’s one thing to be told that this is good thing, that this will help you thrive. It’s another to experience and explore for yourself. I always say: don’t believe me, try it out for yourself. So we held the workshop in the morning, mid-week. We began every session invoking the magic of rituals. Each call started with a mudra meditation. We combined a mudra (hand held gesture) and a mantra (words repeated during meditation) as a way to quiet the mind and come together as a community. Throughout the course, we explored various meditations and creative presence tools via a mixture of lecture, experiential meditation, reflection, soul inquiry and share. I applied for the EAP MADE grant because I appreciated EAP’s focus on regenerative practices and modeling of racially diverse leadership voices. I wanted to share this workshop because I have experienced first hand the gifts of spiritual practice in my work and personal life. 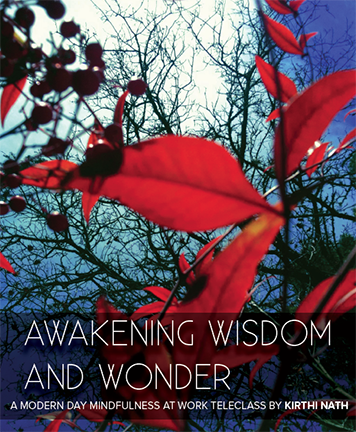 I offered this specific wisdom workshop because I was frustrated with the dominance of whiteness in Westernized wisdom teachings and wanted to be part of the expansion of diverse voices. I thought it was important to invite more people of color to be part of the conversation — as leaders, co-creators and also part of the ever growing cultural library of resources referenced and passed on. When I first met Michelle, my EAP Project Facilitator, she asked me, “How can this experience support you? We trust what you offer will be of benefit for the community, so let me know how we can support you”. I was taken aback, so I was honest. I asked for an extension for the workshop start date so I could go on spiritual retreats. In October I went on a 7-day silent Metta retreat and in December I went to Hawaii for 7-days and swam, looking into the sky chanting metta phrases every day. I share this because I almost didn’t. I wanted to share so much in this course, it’s like a Michelangelo sculpture — you carve away what’s not needed. I almost didn’t include Metta in the workshop because I thought it was either too Buddhist or co-opting Buddhism, but an inner voice whispered, this gladdens your heart, you know the energy of this practice, share it and trust that they will know what to receive and what to let go, and you will pass this on honorably. Oftentimes with callings we feel we’re not ready, that we need more preparation, we need more learning, more, more, more. But callings come to us when we’re ready to listen — and we grow with it. I’ll never forget the first day of our workshop – none of us knew each other yet we knew, we were exactly where we meant to be. Open. Perhaps you can relate. To be great and valuable, the inner critic chimes in to say that you need to be able to do it all yourself. We all know and talk often about co-creation and collaboration. Are you still hirable if you ask for help? Can you thrive when you practice self-compassion and gratitude? The EAP MADE grant let me explore this. There was a part of the grant for me as visionary and a part for workshop delivery. Like you, I’m multi-talented and could’ve done it all myself. Instead, I listened to my heart which wanted to work with others, to co-create. So I humbled myself and hired Jason Wyman to design the workbooks. We worked very closely as I developed all the assets, and then I let go. What he created was beyond my imagination and just like I dreamed. And I paid him market rate. I mention money because it’s important we break the ceiling that’s real and self-perpetuated, and we honor ourselves and each other by paying each other well. This was my leap. To allow help. To explore and experience more deeply what it’s like to co-create wonderful in community, and give myself the chance to focus on content creation, delivery and showing up. 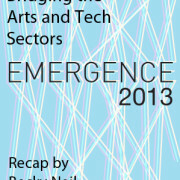 Emerging Arts Professional and the MADE grant is rare. It gives grants to projects that are needed but not mainstream. It comes with real people who really care in your successes. 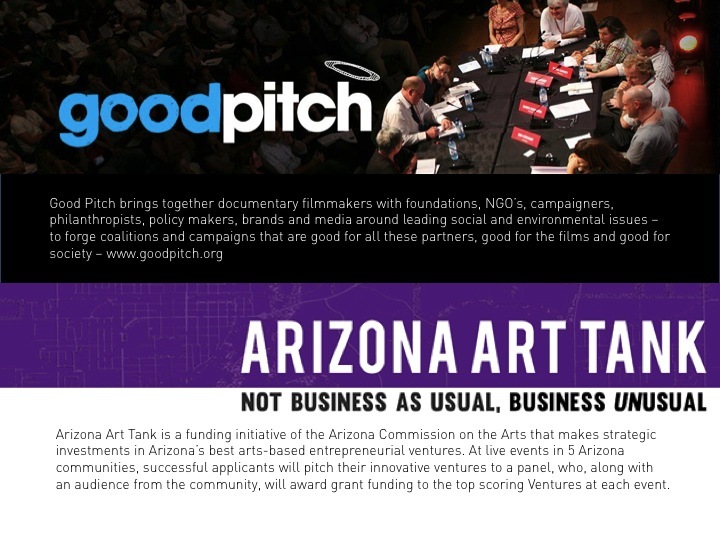 If you have an idea or project that’s aligned with a MADE grant, I encourage you to apply. I almost didn’t, and look what blossomed when I took the leap! Kirthi Nath is an award-winning filmmaker who believes that ordinary people ripple extraordinary change. Kirthi is the creative director and lead filmmaker at Cinemagical Media, a media production company that focus on creating films and workshops that support individuals, communities and companies to ‘be the cause that creates the effect’. In addition to filmmaking, Kirthi teaches (in person and online) courses and delivers talks that focus on Creative Presence, Spiritually, Mindfulness and the Practice of Good. 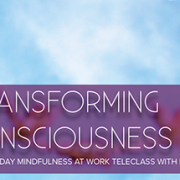 In 2014 she was a Made Grantee and taught a 4-session online course about Modern Day Mindfulness at Work. Kirthi has practiced meditation, been on numerous silent retreats and immersed into informal and formal Buddhist and Yogi studies since 2001. You’ve been at that great feast. The one where the food is tasty and the conversation has got good flavor too. You take a bite while listening intently to the fellow across the table. They sip some of wine while you give your two cents on the state of affairs. Well we had a bit of that going on at What’s for Dinner? 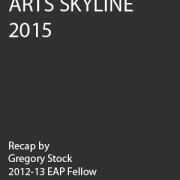 Bringing Racial Equity to the Table for Emerging Arts Administrators, an EAP MADE project awardee. 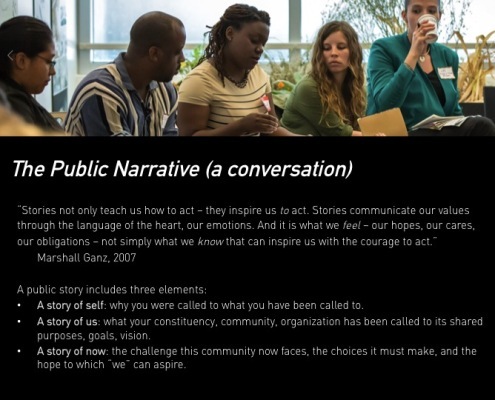 On October 18th artists and staff from several Bay Area organizations came together to talk about what structural racism looks like in their field, at work, and in their lives, and what to do about it. It was a juicy conversation indeed. We began by establishing some clarity around language. What is white privilege? Internalized oppression? Institutional and structural racism? Are diversity, inclusion, and equity the same? Why does it matter? Popular narratives around success and failure in the United States are so divorced from a structural analysis that it inevitably serves to reinforce racism, and even other forms of oppression. And yes, we also talked about the role that art plays (intentionally or not) in that process, and how that process influences the making of art. 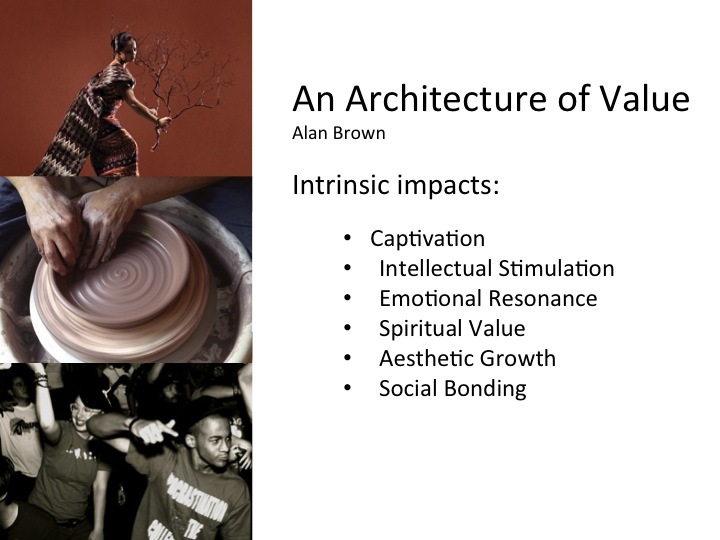 And finally, we explored what that means for artists and arts organizations to be a major source of that narrative, of storytelling in our society. One of the earliest ways that we try to make sense of the world is to try to understand the stories that are told to us. As a result, we have millions of conditioned responses swimming around in our head. This is good, and that bad. Watch out for this one. Embrace that. Hold this one at an arm’s distance. We are constantly juggling them, trying to keep them in check. What do we do with all of those stories? What do they do to us? 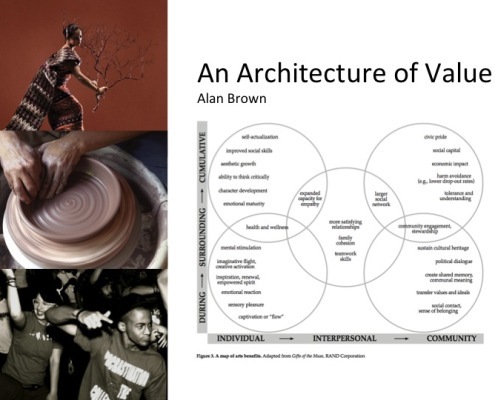 From here we investigated the influence of implicit bias and resolved that there is interconnectivity among the art, society and the artists. Storytelling for the artist is deeply personal, and the response to that art is both personal (including privilege, bias, etc.) 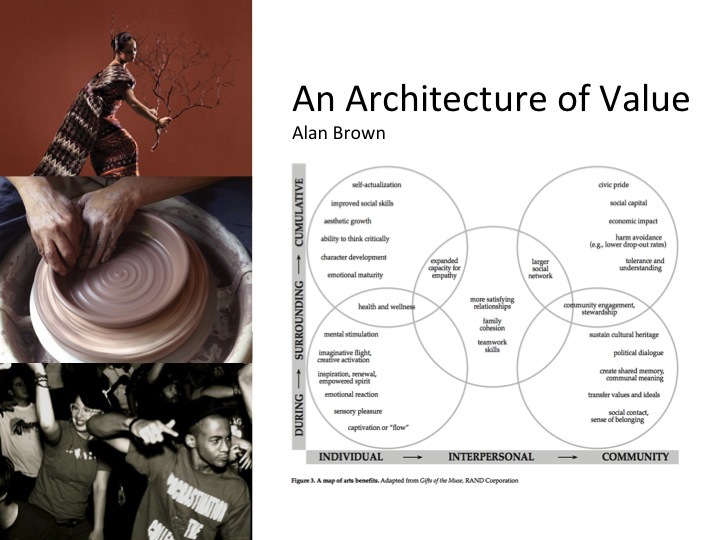 and structural (swimming in the context of history, culture, etc.) The mere existence of our art is not just a comment on the art itself, but also the structure in which it exists. So we dug deeper and unpacked our various identities in the context of privilege and marginalization. We even asked the scary question, “How does identity exist within your organization or the arts community?” Then we went even further and explored how we could leverage our areas of privilege for the greater good by making very direct, conscious choices around issues of race. And we did it all while making some amazing Play Doh art! So yes. You missed a great dinner conversation. So don’t miss out the next time we decide to serve up some realness around race and the arts. 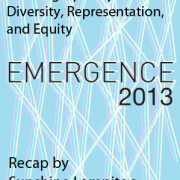 In our ten years of experience as arts administrators, we have come across the issue of racial equity time and again. However, we didn’t know how to speak about racial equity and the arts so that colleagues and leadership would be able to listen and hear us until going through Tammy Johnson’s Step-Together-Step curriculum. 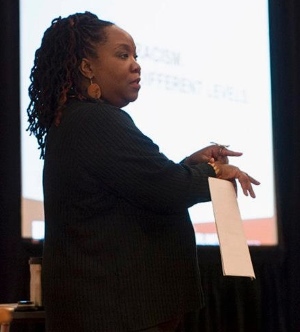 In response to our desire to push the conversation of cultural equity forward, we applied for Emerging Arts Professionals’ (EAP) MADE program and were awarded the opportunity to bring in art and racial equity trainer Tammy Johnson to the EAP network. Our goal for “What’s for Dinner: Bringing Racial Equity to the Table for Emerging Arts Professionals” was to provide a safe space for emerging arts administrators, artists, and allies to learn how to tackle issues around cultural equity that might arise in workshop participants’ respective cultural institutions. We all come from different places, but we hope that the Emerging Arts Professional’s continued dedication to this issue would allow the network to find common ground to advance a culture that calls for a more equitable society. Cristal Fiel holds a bachelor degree in Sociology and Ethnic Studies from the University of California, Berkeley. As Editor in Chief of the literary and arts organization, Maganda Magazine, she discovered her calling to work in the arts field. She has served as administrative coordinator and board member of the Asian American Women Artists Association, and has volunteered with a number of Bay Area organizations, including the San Francisco Film Society. Fiel is currently a program associate at the San Francisco Arts Commission. 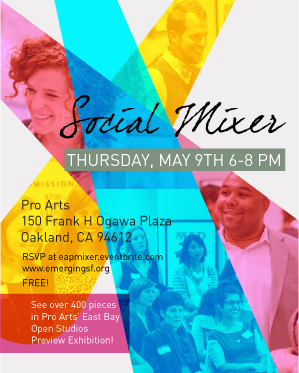 Tyese Wortham is a grantmaker and administrator in the arts, teaching artist, and dancer with a commitment to advancing cultural equity in San Francisco Bay Area’s arts landscape by serving under-represented and under-resourced communities. She has been recognized for her expertise in cultural arts as a panelist, consultant, facilitator, and committee member for various Bay Area arts organizations, including the Isadora Duncan Dance Awards. Tyese served as a fellow in the first cohort of the EAP Fellowship Program. 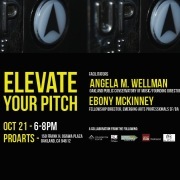 Creatives gathered at Pro Arts on Tuesday Oct 21st for the Elevate Your Pitch Workshop. 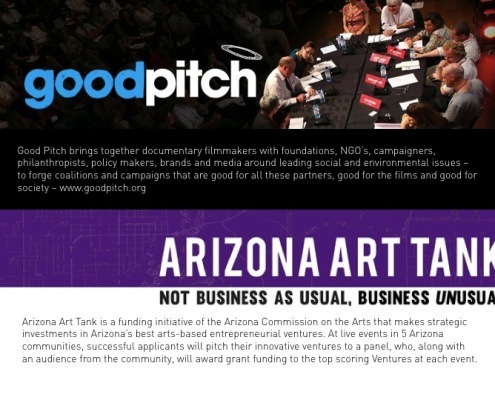 The goal of the workshop was for participants to practice and improve upon their pitches, whether that meant a solo artist applying for gallery representation or a theater start-up organization pitching to investors. Participants included, independent visual artists, performers, Theater Interns, and others working in the arts; as they entered the gallery they were introduced to the evening with a visual name game. Everyone was asked to illustrate the meaning/story of their name and to present that story to the group. The ulterior motive to this name game, later disclosed by the facilitators, was to get us all engaged in telling a brief story, one that we knew off the tops of our heads and felt deep passion or connection to. 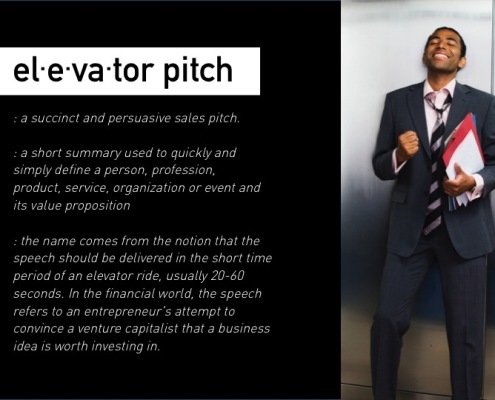 This exercise led to a brief presentation on broader ways to look at our own pitches. 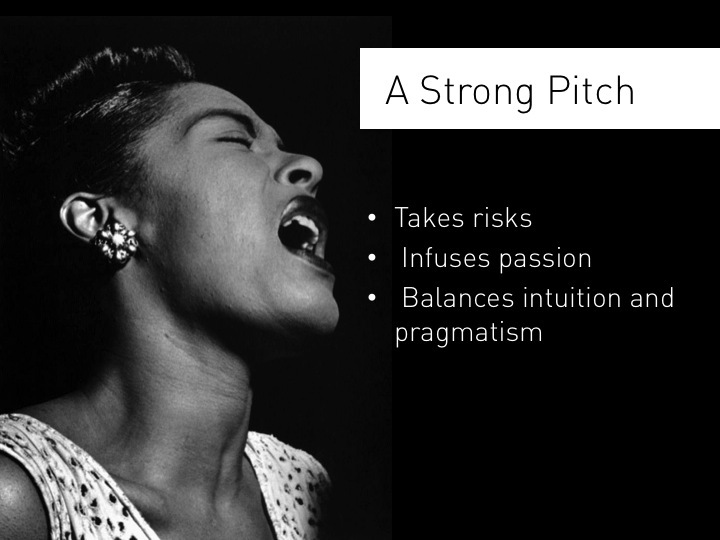 Workshop co-facilitator Ebony McKinney, Independent Consultant and Fellowship Director of Emerging Arts Professionals of the SF Bay Area, touched on the nuanced differences between the business/venture capital and cultural/art uses of The Pitch. 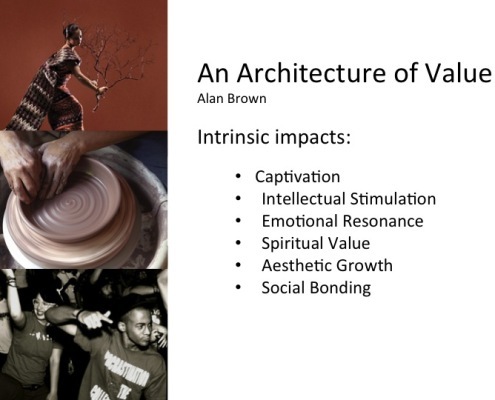 Particularly she referenced Alan Brown’s “Architecture of Value” diagram as a compelling resource that dissect the levels of impact arts and cultural workers have on those around them. 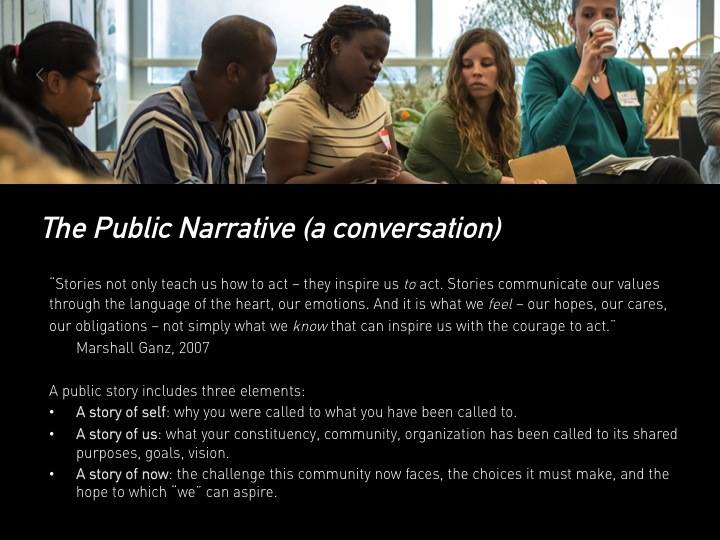 Ebony also introduced the ideas of Marshall Ganz, as a framework for pitches that tell the Story of Self, the Story of Us and the Story of Now and challenged participants to make these stories a part of a public narrative by allowing The Pitch to be more than conversation starter. 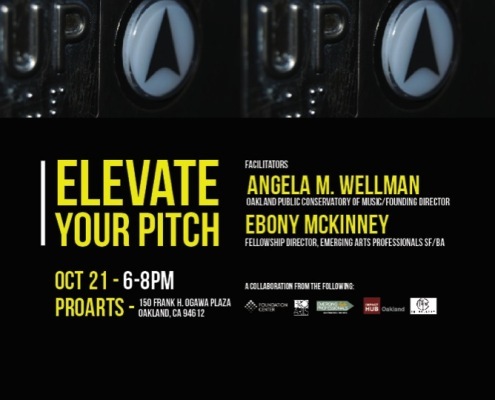 Co-facilitator Angela M. Wellman, Founding Director of the Oakland Public Conservatory, told her own personal success story which included always “having your chops” together. 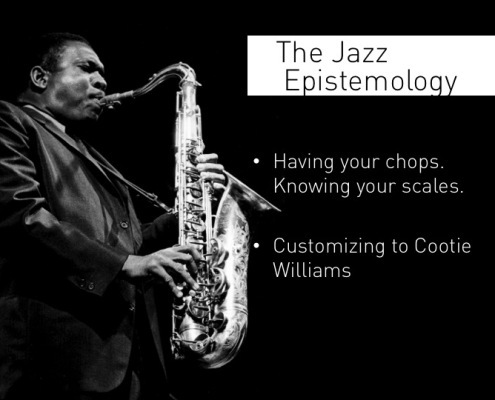 As a jazz musician, she practiced scales on her own until the moment came for her to step in and play – being prepared to impress, she says, is one of the best things artists can do for themselves. 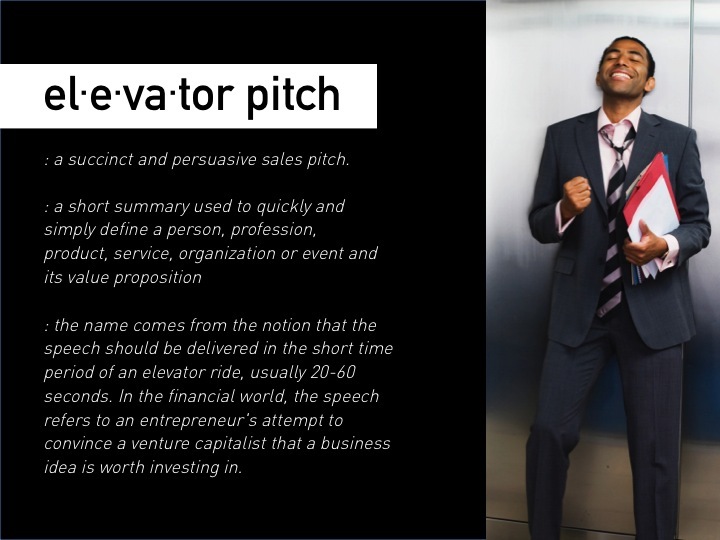 In a casual yet genuine way, all attendees were able to discuss their individual pitches with the leaders and each other, helping develop delivery style and even the ideas themselves. Angela M. Wellman, Oakland Public Conservatory of Music/Founding Director – Trombonist Angela Wellman, hailing proudly from Kansas City, Missouri, has performed with the McCoy Tyner Big Band, Joe Williams, Al Grey, Slide Hampton and other noted musicians. 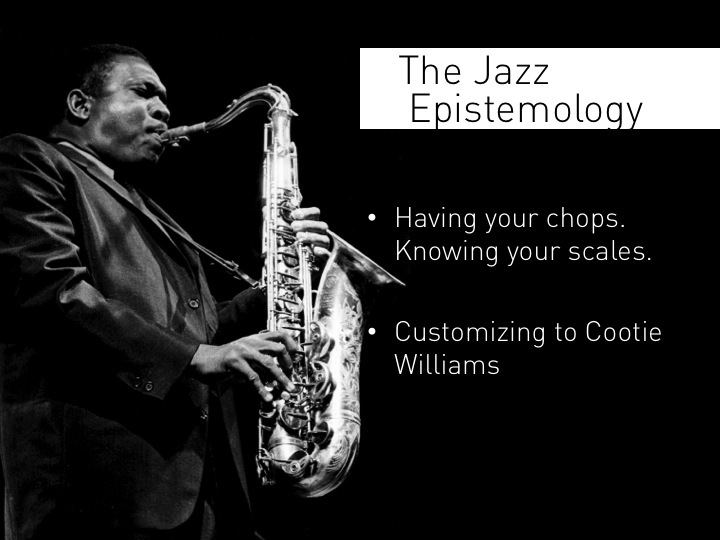 Raised in Kansas City, Missouri, Ms. Wellman was nurtured in a musical family, and is a third generation jazz musician and music educator. She grew up listening to the stride piano style of her grandfather, her father’s swinging ballad & blues piano, and the soul-stirring songstylings of her mother, Jyene Baker. 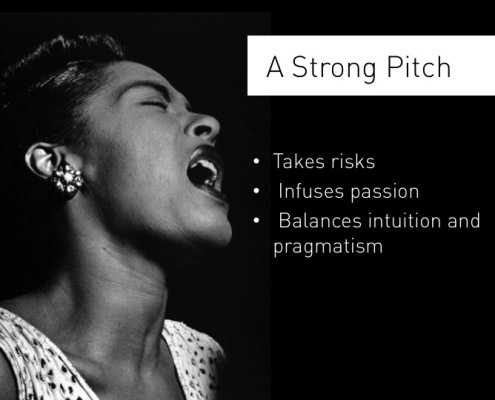 Angela inherits her passion and understanding for the preservation of musical traditions through education from her uncle and mentor, Eddie B. Baker, Sr., founder of the Charlie Parker Memorial Foundation & Academy for Performing Arts and the International Jazz Hall of Fame. Angela’s initiation into the world of Jazz as a player began while hanging out at sessions at the famed chitlin’ circuit Local 626, the once–Black musicians’ union in Kansas City, and now sanctuary for the spirits of jazz pioneers such as Ernie Williams (The Last of the Blue Devils), Count Basie, Charlie Parker, and countless others who got their start in that very place. In 2005 she founded the Oakland Public Conservatory of Music to provide high quality, affordable music education for Oakland citizens. Angela divides her time between Oakland and Madison, WI where she is pursuing doctoral studies in Education/Curriculum and Instruction at the University of Wisconsin. She also performs and teaches throughout the United States. Her band, New Roots, performs spirited, contemporary music, creating new forms, styles, and roots in the Jazz tradition. Ebony McKinney, EAP Fellowship Director, Independent Consultant – Ebony has a diverse range of experience in non-profit, philanthropic and government organizations. McKinney served as the founding director of Emerging Arts Professionals/SFBA, a network focused on empowerment, leadership, and growth of next generation arts and culture workers in the San Francisco Bay Area and was instrumental in helping to establish the statewide California NextGen Arts Leadership Initiative funded by The James Irvine Foundation and The William and Flora Hewlett Foundation. She has held positions with Intersection for the Arts, the San Francisco Arts Commission and the Kely-Strayhorn Theater in Pittsburgh, Pennsylvania. 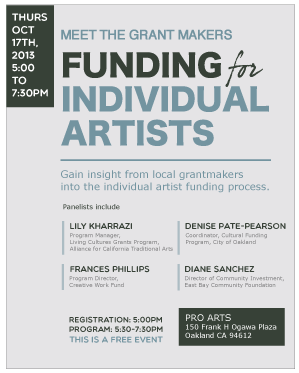 McKinney has participated in grant review panels for the National Endowment for the Arts and the Oakland Cultural Affairs Commission and currently serves on the on the Citizen’s Advisory Committee of Grants for the Arts/San Francisco Hotel Tax Fund. Ebony holds a BA in Communications from Chatham College and MA’s in both Cultural Entrepreneurship and Visual Anthropology from Goldsmiths, University of London. 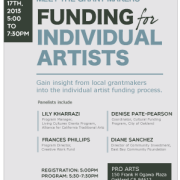 Gain insight from local grantmakers into the individual artist funding process. 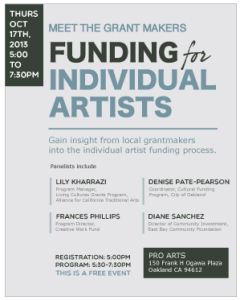 Join us for this unique program featuring local Bay Area arts funders as they describe their organization’s funding priorities and guidelines, discuss regional arts and culture funding trends, and offer practical tips on how to apply. 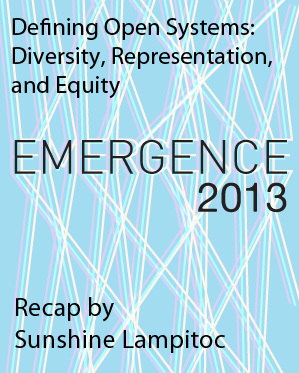 As part of Emergence, Emerging Arts Professional’s daylong annual convening on June 3, 2013, a panel discussed what it means for a system to be open and healthy. Defining and creating open systems involves many components but, for some reason, “diversity” has become the catch-all term for discussions about changing population demographics, inclusion, equity, and representation. 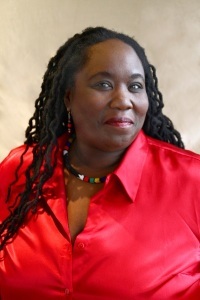 However, Lynn Johnson, co-founder and CEO of Glitter & Razz Productions points out that “diversity can’t be the only component, and it can’t be the lead component.” Each of these aspects requires unpacking on their own, both on individual and systemic levels, before any type of movement or change can be planned or enacted. 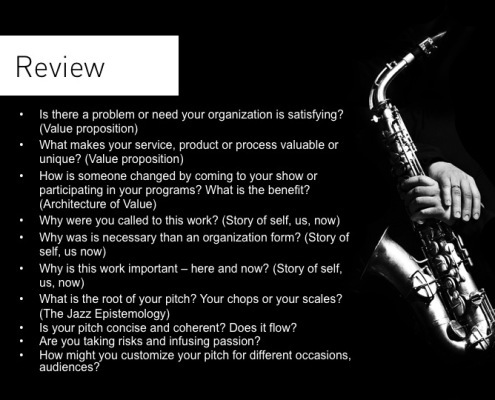 Defining these potentially loaded terms and concepts is the first process dancer and organizational equity consultant Tammy Johnson goes through with organizations. “Let’s get clarity,” she states. What is the definition of diversity? Inclusion? Equity? What does all this stuff mean when the rubber hits the road?” To enact systemic change, it is immensely important for everyone to be starting on the same page and speaking the same language. Parsing the diversity of thought that exists within diversity conversations is the first step in addressing how a truly open system can be created. 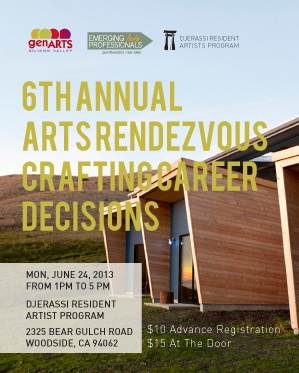 Emerging Arts Professionals, genARTS Silicon Valley, and Djerassi Resident Artists Program invite you to join us for an afternoon getaway and fishbowl discussion about crafting career decisions. Crafting a career in the arts is rife with decisive moments. How do we approach them? Who do we turn to for advice? 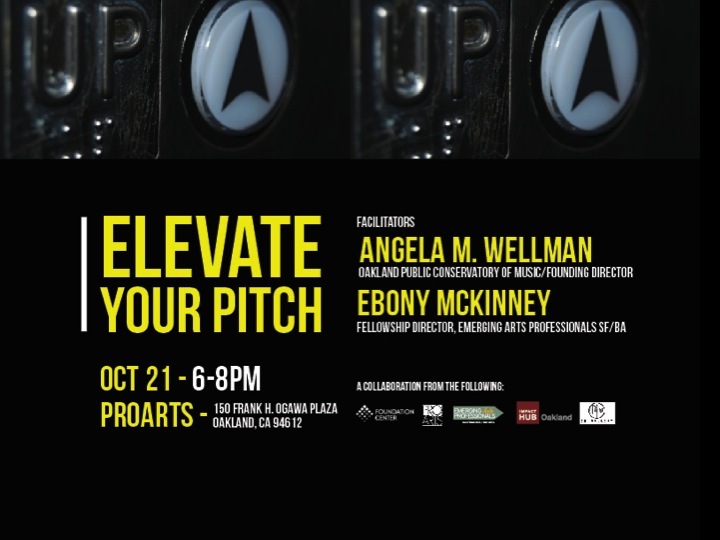 Join Bay Area arts professionals, administrators, and artists at all stages to discuss the decisions we make affecting our careers. Hike in small groups through Djerassi’s stunning landscape to see a handful of the almost 40 on-site sculpture installations by past artists-in-residence and use the time to think and share about your career experiences, pivotal moments and transitions. Bring layers and shoes suitable for hiking on steep dirt trails. 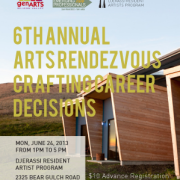 Replenish with delectable snacks prepared by Djerassi’s Chef, Dan Tosh. Reconvene in the Artists’ Barn for the fishbowl discussion. We have invited some arts professionals to get the conversation started, but we need you to jump into the fishbowl to keep it going. Come with thoughts in mind or discuss on the fly. Walk away with new inspiration and contact information for that awesome person whose brain you have been dying to pick. Need a ride or willing to drive? Carpooling is highly recommended. Join the event and post a message here to connect with people in your area who need a lift or are able to provide one. 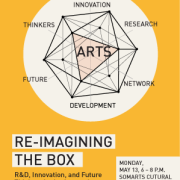 Emerging Arts Professionals / San Francisco Bay Area invites you to an evening of open forum discussion to assess where and how R&D fits into arts and cultural innovation. 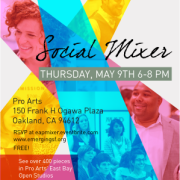 Join us on May 13 at SOMArts. Register today! 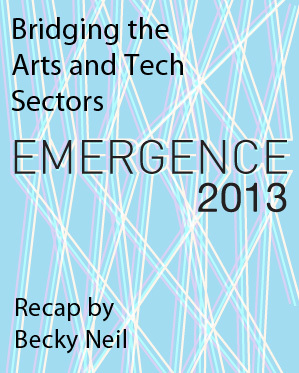 When other sectors are experiencing growth at exponential rates, how can we as arts leaders re-prioritize and re-imagine the R&D process to create impactful and innovative works in our communities? Does R&D necessary lead to innovation–and what does innovation in the arts field even look like at this point? 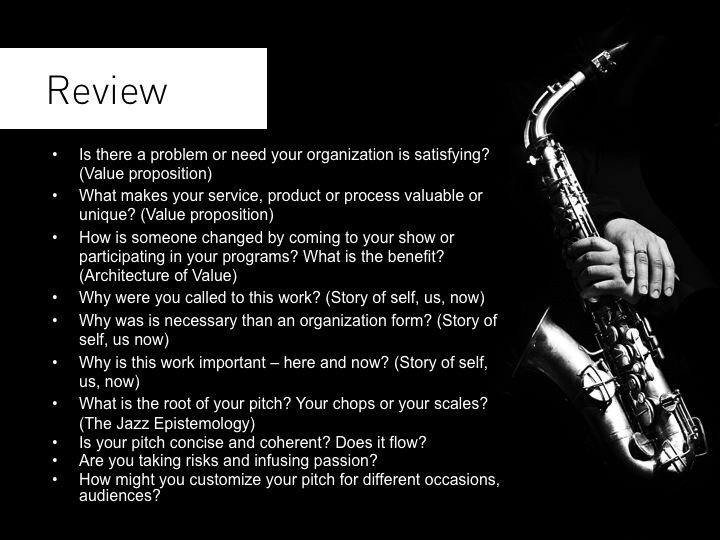 We’re conducting a little R&D about R&D, with plans to create a real resource for those in the field who are interested in the now, new, and next. Who are the future thinkers in the field? How can we make forward thinking in the arts a higher priority in cycles of support? We’ve invited some future thinkers of our own to get the conversation started, but we need you to bring you own ideas (#BYOID) to make it count! Our ultimate goal with this forum is to create a resource informed from your ideas. It will offer a space to share and learn about ways our peers continue to push the field into new directions–but to get things started, we need you! 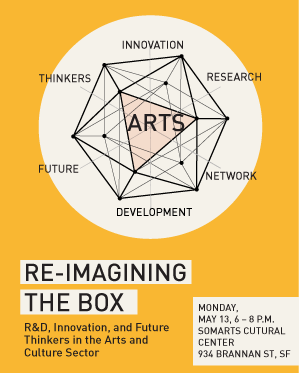 Re-imagining the Box is supported by the SOMArts Cultural Center’s Affordable Space Program, which provides subsidized, large-scale affordable space and technical assistance to nonprofits. SOMArts receives support from the San Francisco Arts Commission’s Community Arts and Education Program with funding from Grants for the Arts/The Hotel Tax Fund. The mission of SOMArts is to promote and nurture art on the community level and foster an appreciation of and respect for all cultures. To find out about SOMArts classes, events and exhibitions, please visit www.somarts.org.